Arby’s has steadily been adding height to its glorious Meat Mountain, where the classic foothills of roast beef have been piled ever higher with the likes of brisket, turkey, ham, and a surprisingly OK new pork belly. The latter was unexpected, but is nothing compared to the new surprise addition of venison. That’s right. 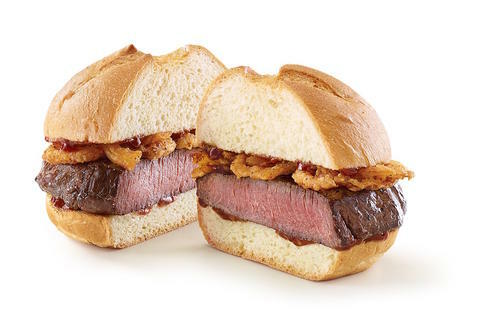 Arby’s is getting into the wild game game with the addition of the venison sandwich, which starts with a thick-slab of deer meat and is piled up with juniper-spiked steak sauce and crispy onions. The chain’s testing the Bambino (not the real name) through November at 17 locations in six hunting-happy states -- Wisconsin, Minnesota, Michigan, Pennsylvania, Tennessee, and Georgia – where the sight of a venison steak at a fast-food chain is somehow more surprising than the sight of a deer roped to the back of every single F-150 on the highway. This marks perhaps the first time wild game has appeared on a fast-food menu, picking up on a nationwide trend toward healthier meats (venison is one of the leanest meats on the market, and way cuter than a cow). If this catches on, Arby’s will be at the forefront of a trend as fast food makes a move to healthier fare. And if it does catch on, perhaps they’ll even get a new mascot. Might we recommend a camouflage beret-wearing buck named Sam Venison? Andy Kryza is a senior editor at Thrillist who will be dressing as Sam Venison for Halloween. Follow him up the Meat Mountain @apkryza.